Debrina L. Washington owns and operates a virtual law practice in New York. Photo courtesy of Debrina L. Washington, licensed to About.com. 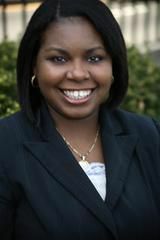 Debrina L. Washington owns and operates her own NY-based virtual law practice, DL Washington Law. Debrina is also the single mother of an adorable, energetic toddler. Debrina Washington is a graduate of the University of Pittsburgh School of Law. Her law practice focuses on providing affordable legal services for New Yorkers and, in particular, providing for the specific legal needs of single parents. By offering legal services in a virtual environment, Debrina serves single parents at all hours of the day or night. I am an undying advocate for Single Parents. Similar to other single parents, I'm constantly concerned about time, energy, health, finances, etc. Additionally, I have concerns about the welfare of my child, custody and visitation issues, divorce and relocation. I plan to provide clarity on family law issues that affect single parents. Single parenthood can be frightening. Let's help each other get through it.